Whether you want to buy a used ATV for power sports or utility, Want Ad Digest is your one-stop resource for listings and useful information. We carry classified ads for all the major brands, including Polaris, Cam-Am, Honda, Yamaha, Kawasaki and more. Utility ATVs: Primarily used on farms and ranches, this is the most popular category of ATV in the United States. Designed to move heavy loads under rugged terrain, utility ATVs are handling labor that was once the domain of horses. Utility ATVs are generally heavier and slower than recreational models. Most have four wheels, and can be equipped with a wide range of accessories, such as sprayers, spreaders and plows. Sports ATVs: Used for recreation and racing, these vehicles provide their owners with the thrill of riding on challenging off-road environments. Lighter than utility ATVs, sports ATVs are built for performance, and are more interactive and complex to drive than cars. Two-wheel ATVs, which are the most difficult to drive, offer greater jumping ability and higher speeds. Quad bikes are a steadier, safer option for young people and beginners. Some expert riders prefer the lightweight three-wheelers, but they are difficult to navigate, and have significant potential for rollovers. These safety concerns prompter a halt in manufacturing three-wheelers from 1987-1997, but they are once again available for sale. Side-by-side ATVs: These models are a cross between utility and sports ATVs. They resemble golf carts, and can be equipped to handle passengers. Side-by-side ATVs can be registered as street legal vehicles in many parts of the country. Youth models: Quad ATVs designed specifically for children are smaller, usually 100 to 150 lbs. Offering minimal power and automatic transmission, they are designed for those with little or no riding experience. With the exception of youth models, all ATV types are available with manual or automatic transmission. Manual offers greater control when towing or riding on steep inclines. Automatic ATVs are easier to operate, and enable you to enjoy the scenery without having to focus on shifting. Once you’ve decided which type of ATV is right for you, it’s a good idea to check an ATV price guide, such as Edmund’s or Kelly Blue Book, to determine the fair market value. Now, you’re ready to start shopping! 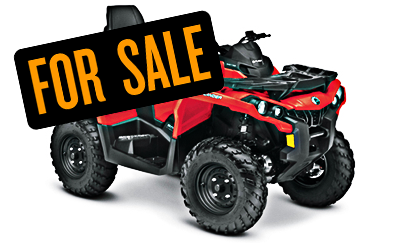 So check out the huge selection of used ATVs right here at Want Ad Digest. And before you know it, you’ll be ready to hit the trail. 1. Be sure to provide complete details about your ATV for sale, including: year, make, model, mileage, trim and condition. For example: ATV Suzuki 2005 Quad Runner, 4WD, 200 mis. Good condition. 2. Include any “extras” that might appeal to buyers, and disclose any repairs needed. 4. If your ATV is in good condition, a photograph can help you make the sale. 5. Clearly list the price. You may want to note whether it is firm or negotiable. An online pricing guide, such as Edmund’s or Kelly Blue Book can help you determine the fair market value of your ATV. 6. Make sure your contact information is accurate and easy to find; otherwise, an interested buyer will simply move on.